Description: Goalkeeper Champ is a fun ball defense game. As a good goalkeeper, can you lead your team to win the game? 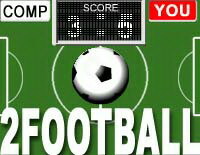 Your mission is crucial, that is to prevent the football from shooting the goal when the ball is close, click on the screen to resist the ball swiftly. If your speed is not fast enough, your team may lose the game. Fight for honor! Good luck and have fun! Control: Left click on the screen.